The solution: A frosted and cinnamon colored glass block shower window. Ordinary smooth faced glass blocks can be transformed into decorative and stylized building elements when you add colors (in this case cinnamon was chosen) and frost the blocks (the frosting process makes the block more muted and private). 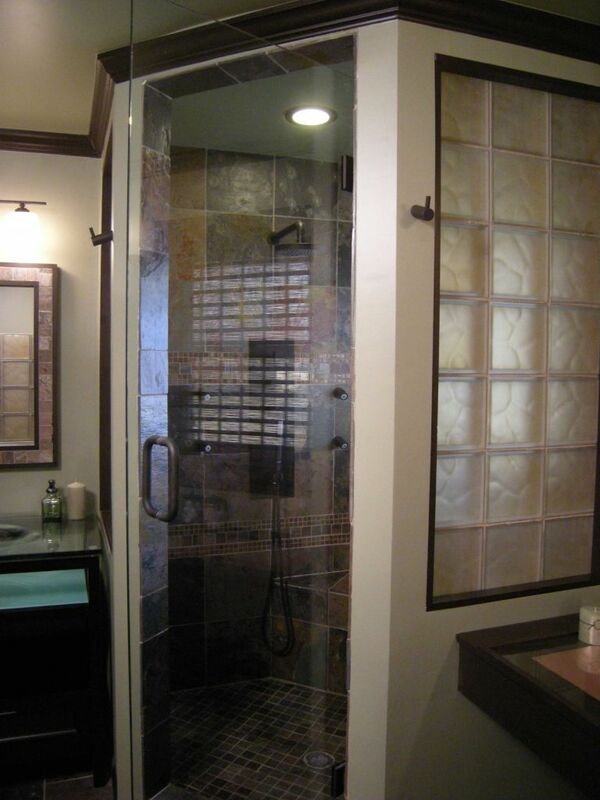 A privacy wave pattern glass block from Mulia Incorporated was used for the project. The glass block window process: Individual glass blocks were made into prefabricated window assembly using a vinyl stack spacers between both the horizontal and vertical joints. The glass block shower window was made slightly smaller than the rough opening size. The window was shipped to the job site in Minnesota and the window assembly was set and installed into the opening (this is most commonly done with mortar). The window joints can then be finished with either sanded grout or for extra waterproofing protection choose urethane grout. Tiles were finished up to the block window on the inside. 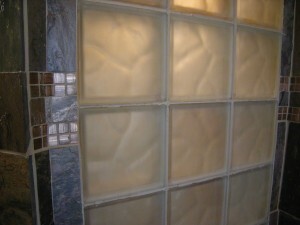 The glass block shower wall process: The glass block shower wall used the same process. A premade vinyl stack assembly was built in sections (to make them easier to install) and shipped to the site. The sections were set into the opening with specialized anchors and then mortared into the opening. The joints were finish grouted to match with the surrounding tile walls. Once again the tile walls were finished to the glass shower walls. 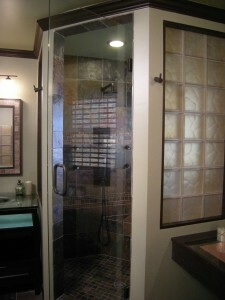 The advantages of the colored and frosted glass blocks in a shower window or wall: Using the combination of a privacy block pattern with a cinnamon colored and frosted glass block provide not only privacy but also a muted softer look not normally associated with the standard smooth faced glass blocks. Are you struggling with a shower window project and looking for a solution? Have you done a project like this and would like to offer some words of advice? If I can help more please comment below. To get learn more about shower remodeling and shower windows using colored and frosted glass blocks and visit Columbus Glass Block (614-252-5888) , Cleveland Glass Block (216-531-6363) or Mid America Glass Block (513-742-5900)of Cincinnati and Dayton Ohio.